When I decided to add interviews to my blog, I wasn’t thinking I’d have the chance to talk to six authors at one time, especially for my inaugural interview post. 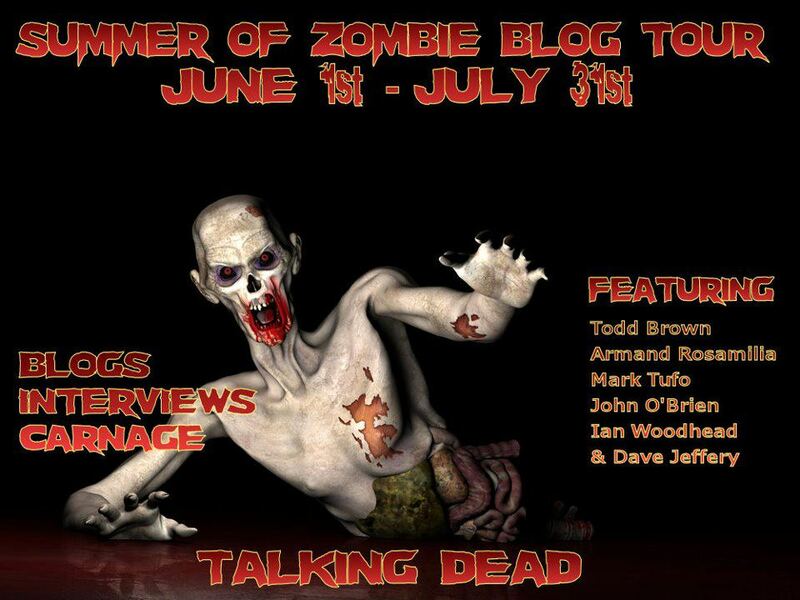 Being in the right place at the right time (also known as being on Facebook, all the time…) allowed me the chance to host The Summer of Zombie Blog Tour, featuring Armand Rosamilia, Dave Jeffery, Mark Tufo, Ian Woodhead, John O’Brien and Todd Brown. The Summer of Zombie Blog Tour has the six authors making their way around the blogosphere throughout the month of June, today just happens to be my place. I’m a new writer breaking into the writing industry. How did you guys get your start and when? Dave Jeffery: To be honest, I’ve been pretty lucky. My first published novel (a mental health related text) was acquired by a specialist publisher who was looking to expand into general fiction. From this the Beatrice Beecham series was released. At this time I was experimenting with the eBook market and self-published Necropolis Rising via this platform in September 2010. The book attracted a small following which appeared to grow with invites to several zombie related anthologies. By spring 2011 the book was a #1 bestseller on Amazon and paperback rights to both book one and book two were acquired by Dark Continents Publishing. It’s been a whirlwind eighteen months with regular invites to zombie anthologies. I really am a lucky guy. Mark Tufo: Tried the whole ‘traditional’ route, when I had enough rejection letters to go into the wholesale paper business I decided to try the indie way. Really had no clue about marketing and promotion, my first book languished for almost 18 months, I guess I kind of thought it would sell itself, naive me. I put Indian Hill out on Amazon in February of 2009. Armand Rosamilia: I ‘sold’ my first short story around 1992 to a side-stapled zine for a free copy and never looked back. Since then I’ve been a publisher (Black Moon Magazine and Carnifex Extreme Metal Zine in the mid-90’s), then Carnifex Press in 2005 and Rymfire Books the last three years. All the while I submitted stories to magazines and anthologies. Sam’s Dot Publishing released my Death Metal novella in 2009 and I started self-publishing soon after. What was the theme of the first thing you wrote for publication? If not zombies, when did you decide to start writing about the undead? Ian Woodhead: I first started on a scifi epic, chronicling two races of intelligent sauron predators who had managed to throw off their primitive chains and develop two civilizations. I put years into that piece. I even thought (some of the time) that it really was going to be an epic. Yeah right. One day, I may even dare myself to dig it out and read it again. John O’Brien: This series is my first foray into the writing world. Technically, the antagonists in the books aren’t undead so I’m not sure I can say I have started writing about the undead. The stories in my head were about various survival scenarios. The post-apocalyptic world creates the ultimate survival situation in my opinion and the creatures were thrown in for added dangers. I will say that my son and friends had a great deal of influence on my decision to write about the series as they were, and are, very much into zombies. Todd Brown: Not counting a high school job writing for a police and fire department news magazine (consisting mostly of having the after action reports transcribed into some sort of new story format) my first story, Dakota, involved two modern day DEA types being thrown back in time to just prior to the start of the Civil War. They are in Charleston, South Carolina, and one happens to be African-American. The zombie thing happened when my college instructor pulled me up after class one day. I’d written a zombie short for fun. She told me that it was clear that I loved the genre. She also told me that it had much more depth than she was used to seeing for “that sort of fiction.” That was the nudge that sent me this way, and I have loved every minute of it since then. Mark Tufo: This is not an easy field, I think a fair number of new writers think this is a get rich quick scheme. ‘I’ll pound out a few thousand words and I’ll be a bazillionaire!’ It is a ton of work, writing the book is the easy part, editing, re-writing, art work, proofreading, marketing and promotion and probably ten other things I forgot all go into making your book successful. I easily spend 60 to 70 hours a week on all of the above listed items. You can be successful, but it’s like anything else in life, nobody is going to hand you anything, you need to go and get it. Dave Jeffery: Keep at it. Read lots of different genres and authors. Learn how people put sentences together, then experiment and don’t be afraid of pushing the grammatical boundaries. You will get people criticising grammar that moves away from convention. This is not to say that you should not learn how to be grammatically accurate. Learn the tools of writing and then bend the boundaries. It makes for a better narrative. Ian Woodhead: Keep writing. That’s it, just write and write and write. Write at work, write at home, go for a walk, and take a notepad with you. Go to the toilet, jot down a few notes (You may need to carry a pen too). Just write. Oh, read as well, if you aren’t writing, read. Call it revision. Who inspires you to write (authors or people in your life)? Todd Brown: I was influenced at an early age by Stephen King. Now, I try to gain a little something from every author I read. However, some of my greatest inspiration now comes from my readers who send me letters and email telling me that I made them laugh or cry. That is the rush. John O’Brien: My readers. And I would sincerely like to thank each and every one of you. I enjoy getting your messages and reading your reviews – good and bad. I truly do write the books for them to be enjoyed. Dave Jeffery: I draw inspiration from all over. I have favourite notable authors, Steinbeck for example, but I also enjoy plenty of work from independent writers who tell tales in a wonderfully refreshing and un contrived manner. If you were given the chance to rewrite any part of any zombie movie/book, which would you choose and what would you do? Mark Tufo: You know I really wouldn’t want to mess with anyone else’s vision, BUT in the Walking Dead, I would have so OFFED Rick’s wife and kid and kept Shane, I don’t think the exchange rate was worth it there. Todd Brown: I don’t know that I could rewrite anybody else’s work. However, I’ve learned so much since Zomblog, I wish I could have another crack at that one. Do you believe a zombie apocalypse could really happen? Are you prepared for it? Ian Woodhead: Anything is possible I suppose. As for being prepared? Hell no. John O’Brien: I definitely believe an apocalypse of some nature can happen and I’d like to think I am pretty well prepared for it. Most of the survival aspect, besides having some of the right tools, is attitude. I’m also out in the country so there will be little direct, immediate impact. Armand Rosamilia: I’ve said it before and I’ll say it again: I hope I die immediately. Patient Zero would be perfect, so I don’t have to worry about important stuff: supplies of M&M’s. John O’Brien: Each of the books fold into the next so I would definitely start with A New World: Chaos. It admittedly starts off slow but builds. Todd Brown: Hands down, for me it is my DEAD series. Dead: The Ugly Beginning is character rich and I feel has my strongest work. The 4th book in the series (Dead: Winter) just landed on May 30th and is having the best opening month’s sales of any of my previous titles. However, I wrote a short story not too long ago titled That Ghoul Ava, and for some reason, I have been drawn back to the title character. I have finally decided to begin work on a full length piece in Ava’s world. This is a horror/comedy bit and a different angle for me that I am excited to see where it goes. Mark Tufo: Man this is honestly like trying to tell you which one of my kids is better, they all have strong points and they all have faults. (My books – well and I guess my kids too!) But since this is a zombie tout it really is kind of a no-brainer (rim shot please!) Zombie Fallout! Thank you for the opportunity to spend a little time on your blog! Thanks for helping me through my first interview as the interviewer. I hope to one day meet all of you at an upcoming convention. Damn, I was looking forward to becoming a bazillionaire too. Oh well. As well as “keep writing” I would also add “write what you want to write.” Don’t try to write something with an audience in mind or you’ll just end up watering it down so you don’t offend anyone. Thank you for hosting us on your blog. It was a blast seeing all of us in one place. It has been reshared everywhere I could.